Due to the nature of a theory, many will contain spoilers from various games. Read with caution. Any Metroid fan is familiar with the space dragon Ridley: Space Pirate general, killer of Virginia Aran, and the last survivor of his race. Ridley is both a loved and hated member of the Metroid universe. He is one of Samus’s fiercest enemies, and has appeared in five of the series’ most popular games. However, how is this possible? How does Samus wind up facing the same enemy time and time again, despite having killed him in numerous previous encounters? We intend to find out. The first battle with Ridley in the Metroid timeline is on Samus’s original mission to Zebes in Metroid / Metroid: Zero Mission. This battle occurred in a lower section of the pirate base known simply as ‘Ridley,’ an area similar to Norfair in its high temperatures and lava pits. When the battle is over, Ridley appears to spontaneously explode, leaving behind no traceable corpse. However, this is a gaming convention; it’s far more likely that Ridley would have left a corpse, or possibly even survived and escaped (though still suffering from fatal wounds). The latter is possible since, as a space dragon, Ridley can survive in the lava of Zebes which Samus (at the time) could not pass through. Thus he could have dropped into the magma at the bottom of the chamber and either remained there or escaped when Samus left the room. He could have easily survived long enough for the space pirates to find him, especially since they likely knew of his defeat (it was required to open the passage to Tourian). Immediately after the events of Metroid / Metroid: Zero Mission, the space pirates began to reconstruct the body of Ridley. Since he was so badly wounded, it would have been impossible for his organic body to properly recover. Thus, the pirates undertook an ambitious project to both save their powerful general and to increase his already vast fighting skills. They rebuilt his body with cybernetic enhancements, giving him mechanical limbs and life support systems. In the process, he was also given armor, mechanical weapons, and other equipment. The great space dragon was reborn as Meta-Ridley. Upon encountering Meta-Ridley, Samus (of course) defeats him. However, we do not see Meta-Ridley die; instead, he is shot by a number of Chozo statues and pushed off an adjoining cliff. He’s seen falling into the mist below; however, is not seen hitting the ground, and certainly not seen dead. While the fall would be more than enough to kill any human (or most other creatures of the Metroid universe), a space dragon could easily survive the impact. It’s not only plausible to believe that Ridley survived the fall, but that he would have been able to walk away from the impact. After Metroid Prime, Ridley takes a small leave of absence in Hunters and Echoes. He is likely recovering from his last fight with Samus; depending on his condition after the fight, the space pirates may have found him unconscious at the bottom of the cliff, or he may have made contact with them himself. Regardless, Ridley is fully repaired by the events of Metroid Prime 3: Corruption, and his restored body is further upgraded with Phazon. When Samus once again encounters Meta-Ridley, she manages to defeat him despite the unusual circumstances (falling through a generator shaft at the time). However, we again do not see Ridley die; instead, Samus is pulled from the shaft while Ridley continues to fall to an unknown end. Of course, since Ridley suffers no structural damage during the battle, it is entirely possible for him to fly out of the shaft and escape (especially considering the maneuverability he possesses in the 2-D games). Once he left Norion, Ridley made his way back to the pirate homeworld where he became the guardian of the planet’s leviathan. Ridley is encountered again in Metroid Prime 3, this time as the further improved Omega Ridley. At this point, he has been further upgraded with more armor and large amounts of phazon. But unlike his former two defeats in the 3-D Metroid world, Ridley does not seem to survive this encounter with Samus; instead, he explodes much as he did in Metroid / Metroid: Zero Mission. 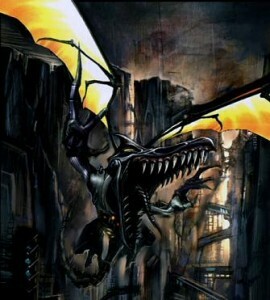 However, this death is believed to be literal, since 1) the graphical style of the 3-D Metroid games makes it much less likely that Ridley’s death was a simple convention, and 2) his body would be much more volatile due to the large amounts of phazon (and other chemicals) contained within it. It seems that when Omega Ridley was defeated, it was the true end of the great Ridley. Nevertheless, the pirate general is encountered again. After Samus eradicates the metroid species, Ridley appears to steal the final Metroid for the pirates. How did he survive the catastrophic events of Corruption? My belief is that he did not. The Ridley faced in Super Metroid is, in fact, a clone. A Ridley clone is not unreasonable. The presence of the Metroid clones at the end of Metroid Fusion makes it clear that technology existed which could produce an organism from a simple DNA sample. Considering his immense combat abilities, it is quite likely that the pirates would have kept a sample of Ridley’s DNA in case he ever was killed. After Corruption, the pirates had a short time of recovery while Samus was busy on SR388. It is in this time that the Zebes base was rebuilt, and I believe that it was also the time in which the Ridley clone was raised. This hypothesis is further strengthened by a look at the two 2-D Ridley encounters (discounting the original Metroid). In Zero Mission, Ridley was fully grown, and stood nearly three times the height of Samus. In Super Metroid, Ridley would have been fairly young; as such, he would have been smaller. The game supports thins: the Super Metroid Ridley stands only about twice as tall as Samus, or only about 2/3 as tall as his predecessor. It is unknown if this clone carries the memories of his previous life or not; however, it is quite clear that this Ridley is a clone. 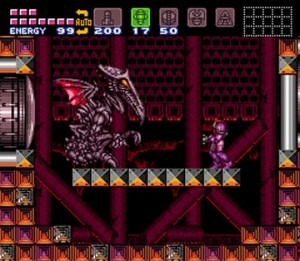 As in her previous mission to Zebes, Samus encounters Ridley and defeats him. 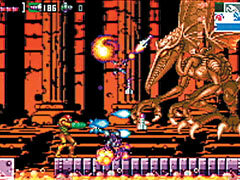 However, this time his death appears to be absolute; while it is possible that Ridley did survive or escape as in the original Metroid, the likelihood of him surviving beyond the end of the game is minute. Zebes explodes after Mother Brain is killed, taking all those on the planet (including Ridley) into oblivion. This is believed to be the final death of the great Ridley. I don’t think Ridley’s a clone or dead. While Metroid has a nice story, it’s not like MGS. I don’t think the developers put THAT much thought into it. They seem to like Ridley too, so he’ll probably be back. Great article Jayon, it gave some really good theories. 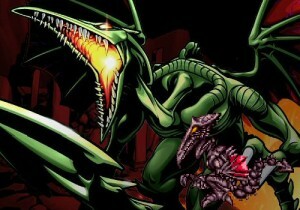 I really think Ridley should be back, I still look forward to Kraid’s epic return though. I don’t know why but these theories of immortality made me think of the song by Queen "Princes on the Universe"
On the subject of Meta Ridley…. On the whole, nice article. Don’t worry, Ridley will be back… he always comes back. Maybe the Space Pirates tried to make another clone but it’s body was captured by the Galactic Federation before it was ready? I’d love to hear more on everyone’s opinion, I might talk with Jayon on doing an update to this sometime soon to include current theory, and user submitted theory. If you think this is something you’d like to contribute an idea to then send an email through the contact page and we’ll check it out. Actually, Ridley may not have died in MP3, because in all previous (in the timeline, that is) appearances by him, he is gray in color. However…in Metroid Prime 3, due to the phazon in him, he is a bluish-purplish color. In Super Metroid, which happens in the timeline after MP3, Ridley is, again, purple. Now, obviously, this is because his original sprite is purple, but…Retro made Ridley purple in MP3 to explain why he had turned from gray (like M:ZM and MP showed him) to purple, maybe? So…if the SM Ridley is a clone, shouldn’t he be gray? Also, I think the Space Pirates started rebuilding Zebes waaaaaay before Metroid II, because otherwise they’d have…less than an hour of time to do so. I doubt they’re that good. I’ve allways thought that at the end of MP3, Omega Ridley teleported out of battle, and ended up in the Sub-Zero area of the B.S.L research station. Then, well, we all know what happens next…The clone idea has always been my favoured idea. Also, my little brother inquires that Ridleys mind was so powerful, that he took over the X parasite, and was still the Ridley we know and despise. But he’s just a kid. i think he will be back,i would like to see ridley in 3 dimensional without all the cyberjuk on him,he will be in scans i hes not in game though. yeah,i think ridley could rebuild himself by molecurally combining his phazon cells together,such as dark samus,but she was heavily corrupted,im not sure,but i know 100 percent he’ll be back,(look up “metroid:other m”,you’ll see he’ll be back). and he’ll be in that particular game because it takes place back in when samus was in the military,and the trailer also shows it,im sorry,i talk to much,but i just love giving opinion! Why don’t you join the forums? in the manga doesnt it state ridley being able to regenerate despite the brutal deaths he had by feeding on any other debris or something like that,sorta like dark samus.